Today is of course the Spring Equinox. The first day of spring in the northern hemisphere. And with the presence of a comet (having the unpretentious name of Pan-STARRS C/2011 L4) visible to the naked eye each day at sunset, it has certainly been a March not to be forgotten. Another reason to make this March unforgettable includes how very cold and wet it has been. Atypical blizzard conditions closed many roads and stranded many people last week. High winds and snow created blizzard conditions last week. 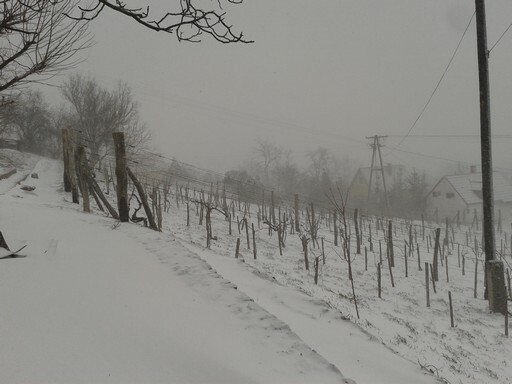 So when I cast my gaze down from the impressive spectacle now going on overhead, and look at the very wet soil, I ponder the best way to get thousands of new wine plants into the ground. 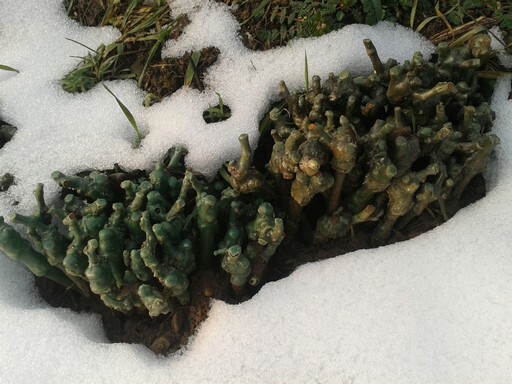 Bundles of new wine plants stored in the ground for winter, just barely poking their tops above the melting snow. And planting must be done soon. You don’t plant that many wine plants alone with a shovel. You either need a lot of people with post hole diggers, or a machine. A contractor with a tractor mounted power auger will be coming by later today to discuss the work.